This blog was authored by Henry Mayo, a surveyor and long-time resident of the Bryan-College Station area. As a surveyor and historian, Henry retrieves information from local, state and national resources to assemble a series of history-themed messages for email subscribers. To subscribe to Henry’s series, click here. 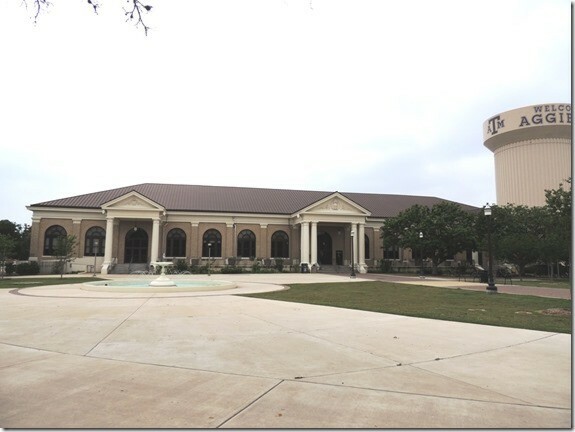 The grand, old mess hall burned on Nov. 11, 1911, so A&M planned and built Sbisa Mess Hall, which stands today. Austrian-born Bernhard Sbisa came to A&M from New Orleans in 1879. He served as supervisor of subsistence at A&M for more than 40 years. 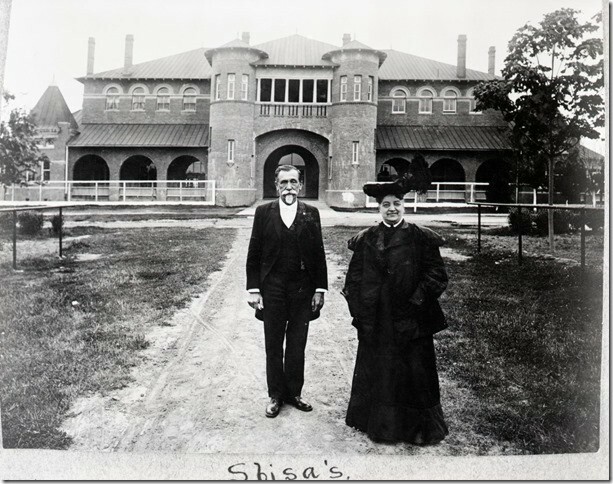 The photo above from the Cushing library Flickr site shows Mr. and Mrs. Sbisa in front of the old mess hall not long before it burned. 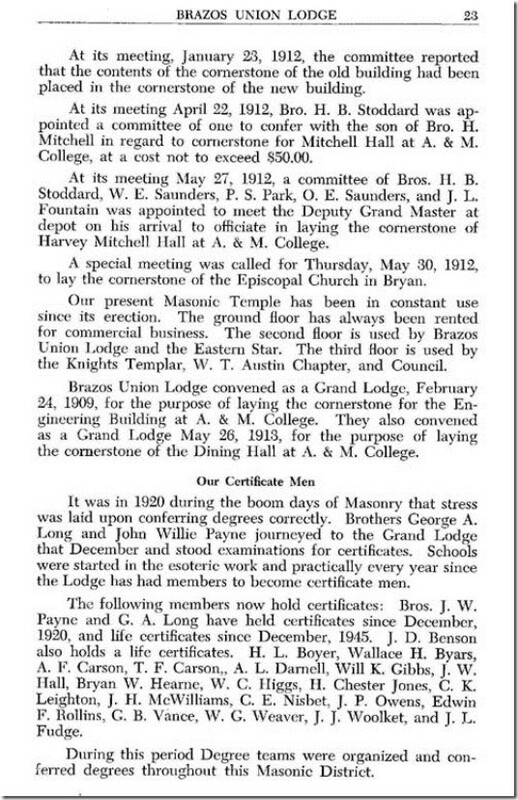 As a side note, the same page of the Masonic Lodge history mentioned above states that the cornerstone for Harvey Mitchell Hall at A&M was set with ceremony on May 27, 1912, 101 years ago this week. 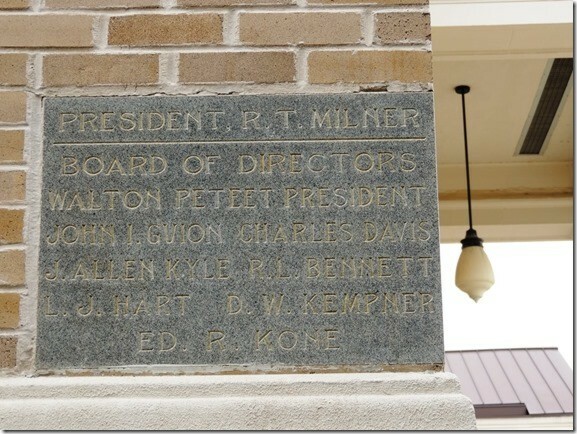 Mitchell Hall was razed in 1972, but today its cornerstone is sitting on a pedestal at its former site, along Military Walk next to the Beutel Health Center. This entry was posted on May 31, 2013 by City of College Station. It was filed under Historic Preservation, Public Communications and was tagged with 75th anniversary, history. 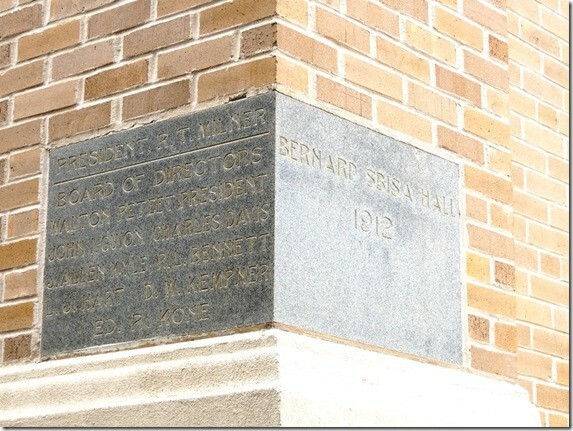 It was appropriate that the Masonic Grand Lodge of Texas leveled the cornerstone for Bernard Sbisa Dining Hall, as Sbisa, like so many other members of the College faculty and staff, was a member of the Masonic fraternity. He received the three degrees of Masonry on 28 Nov 1899, 9 Feb 1900 and 9 March 1900 at Brazos Union Masonic Lodge No. 129 in Bryan. The question of Bernard Sbisa’s ethnicity has puzzled me. Was he Austrian, as is usually stated, or was he Italian? His family was counted twice in the 1880 U.S. Census–once on the A. & M. Campus, and again a couple of days later at their home off campus, where Mrs. Sbisa’s mother lived. I believe they were not home that day, and Mrs. Sbisa’s mother, Francesca Carvera, must have been the respondent who spoke with the census-taker. And so, “Rovinia” appears as Bernard Sbisa’s place of birth on that second census report. (The campus census says he was born in “Austria.”) Although Rovinia (or “Rovinj”) is in what is now Croatia, in the 1800s it was part of the Austrian Empire, and previously had been part of the Republic of Venice. This explains why most of the residents spoke Italian. I found the passenger manifest that lists the arrival of Bernard and John Sbisa at New York City on 8 March 1852. The ship arrived from “Trieste, Italy,” only 100 km. north of Rovinj. There were only five non-crew passengers on board the ship “Arlington,” and Bernard and John Sbisa were the only two on board named Sbisa, and the only two listed as “Austrian.” So the two boys, listed as 10 and 11, apparently traveled by themselves. The only place that I have found Bernard Sbisa’s full birth date is on the official record of U.S. citizens arriving in New Orleans from Havana, Cuba, on 3 Jan 1925 aboard the S.S. Cartago. He made several trips to Cuba during the 1920s, when his son-in-law was working as an engineer with a sugar company in or near Havana. Sbisa’s birth date on that document is given as 27 Nov 1843. This would have made him only 8 years of age, and not 10, at the time of his original arrival in the U.S., in New York City, on 8 Mar 1852 (above).